How do we manage the change events in our lives? That’s the work of transitions. Join Gwynne Guzzeau, HOW’s Executive Director, for an interactive workshop and take away some tools to help you navigate the changes and transitions in your life. Join Us ! Call 508.487.4357 for more information. Learn more about Gwynne Guzzeau in this Banner article. Please note the following corrections to the article: Gwynne is a full-time HOW employee and she no longer works part-time for the National Institute on Out of School Time at Wellesley Centers for Women. Also, she was not chair of the Nauset Regional School Committee, she served as chair of the Joint School Committees for the Nauset Region (a meeting of all four town elementary school committees AND the regional school committee for the middle and high school). Ann Maguire has the power to control the weather! She did that on July 23, 2016 for the Annual Summer Party to Benefit Helping Our Women hosted by Ann Maguire and Harriet Gordon, Linda Glenn and Christina Crowe and Joy McNulty. The skies opened up and a fierce storm occurred about a half hour after the party ended. 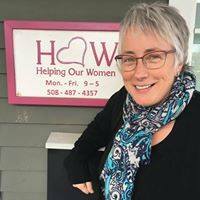 Our 2016 Walking Home fundraiser garnered close to $10,000 to benefit the Cape Cod Children’s Place, Helping Our Women (HOW) and Accessible Provincetown. “We were thrilled with all the walkers who came out, and grateful to all the people who generously pledged. It is an honor to work with so many supportive members of our community.” — Lori Meads Thanks to Dan McKeon for the photo. — at Seamen’s Bank. April 2016 – Lori Meads, Vice President of Seamen’s Bank, has been selected by Banker & Tradesman as a 2016 Community Bank Hero. Community Heroes are known for consistently giving back to the industry and the community, giving freely of their time, energy and resources for volunteerism, community service and charity — and for being a positive influence on peers and subordinates. Congratulations Lori! Our whole community thanks you. “Overcoming Obstacles to Health Care: Transportation Models that Work” is a three-year project launched in April 2011 and funded by The Kresge Foundation aimed at addressing transportation as a barrier to health care access. Through this project, Health Outreach Partners (HOP) seeks to ensure a policy impact on transportation and health care access while capacitating underserved communities with the necessary solutions and information to improve health care access. In order to accomplish this goal, HOP identified and conducted case study site visits with six organizations with effective transportation models. HOW was chosen as one of six organizations to participate in this project. Following this, HOP engaged a policy subcontractor to develop national recommendations on transportation policy and will launch a policy campaign around these recommendations. Further, HOP will develop training and technical assistance resources for communities to better provide transportation options. Please visit this page for periodic updates on recent news from Helping Our Women.